The A-to-Z guide to essential vitamins, minerals, and nutrients, so you can ditch synthetic supplements and promote health naturally with nourishing foods. Vitamins and minerals are the building blocks of good health. But the heavily processed foods that are so common in today’s modern diet are stripped of these nutrients, leaving many people nutrient deficient despite meeting (or exceeding) their daily calorie needs. The accepted solution is to take supplements created in a lab, but the dosage and interactions can be confusing, and supplements are loosely regulated and not always foolproof, especially since our bodies are designed to receive nutrients from natural, whole foods. 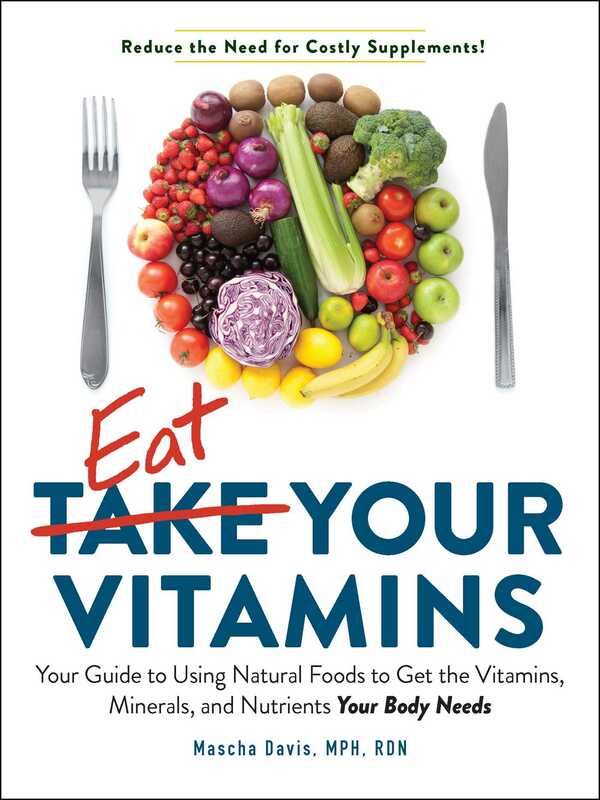 Eat Your Vitamins features fifty key vitamins, minerals, and other nutrients essential to your health. You will find clear definitions of each nutrient along with the role it plays in the body, how it is best consumed and absorbed, recommended daily doses, and detailed lists of foods and natural sources that contain the vitamin along with a recipe for a nutrient-rich meal. Ditch the synthetic supplements and make the right choice about how to properly feed and fuel your body. Mascha Davis, MPH, RDN is a nationally recognized registered dietitian nutritionist, humanitarian, and founder of Nomadista Nutrition, a private nutrition practice based in Los Angeles. She uses an evidence-based approach and Nutrigenomics to help her clients optimize their health, manage chronic conditions, and achieve a healthy weight. Her writing and expertise have been featured in numerous publications and media outlets including Time, CNN, Newsweek, The Washington Post, ABC News, Men’s Health, Women’s Health, mindbodygreen, Bustle, Refinery29, PopSugar Fitness, Reader’s Digest, and many more. In 2016, she gave a TEDx talk about her international humanitarian work in Africa, where she spent five years working on programs for the treatment and prevention of malnutrition in women and children. Her nutrition tips, health advice, and recipes can be found on her Instagram account @Nomadista_Nutrition and her blog on NomadistaNutrition.com.